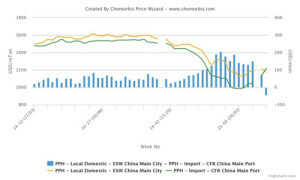 According to data from ChemOrbis Price Index, import homo-PP prices in China have gained a premium over local prices as sentiment has been moving in divergent directions in the import market relative to the domestic market. Domestic homo-PP prices on an ex-warehouse China basis reached their highest premium relative to imports over the past year at around $190-210/ton from late December 2014 to mid-January 2015. Domestic prices have gradually lost their premium in the following weeks, with particularly steep declines occurring in March after the market returned from the Chinese New Year holidays. 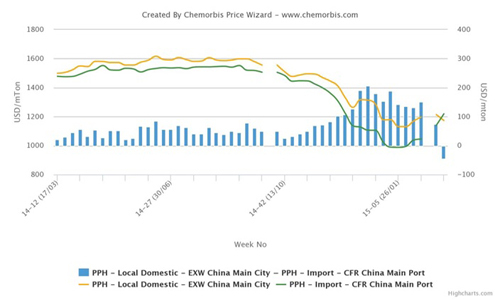 Currently, local PP prices are trading at a discount of around $45-50/ton relative to import prices on a CFR China basis, according to ChemOrbis Price Index. Local prices had last traded at a discount to import prices in February 2013. Players active in China’s import market, meanwhile, are generally optimistic about their prospects, citing firm upstream costs and regional supply tightness as support for their bullish outlook. “Prices are up around $70-100/ton since the end of the holidays and sellers are said to be aiming for some additional increases. Major producers from India, South Korea and the Middle East are offering limited allocations due to supply limitations and South Korea could face ongoing tightness as that country is about to enter a period of heavy cracker maintenance,” a trader based in Shanghai stated. According to data from ChemOrbis Import Statistics, South Korea, India and Middle Eastern countries accounted for four of the top six homo-PP exporting countries to China in 2014 as well as 57% of the country’s total imports.